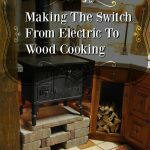 One of the things I’ve learned from starting this site is that there are way more people out there than I expected that still appreciate and practice the old way of living. It’s been wonderful finding like minds and seeing the comradery among readers with similar interests. Collectively, we’ve got all kinds of old timey life hacks that were handed down through our families. Below is a list of 9 from my family that I think are worthy of sharing, some are probably common and some maybe are not. There’s no way to know until they’re shared with others. What are some of your old family hacks? We’d love to know! Put 20 or 30 grains of rice into your salt shaker to keep the salt from clumping if you live in a humid area. A lot of salt has anti-clumping ingredients added to it now days, but luckily there are still some that are all natural. 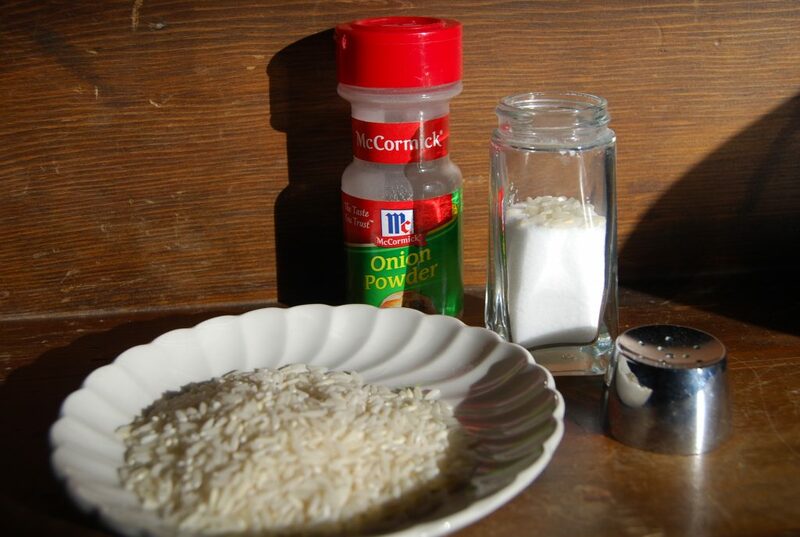 Rice works just as well in other things that tend to clump too, like onion or garlic powder. 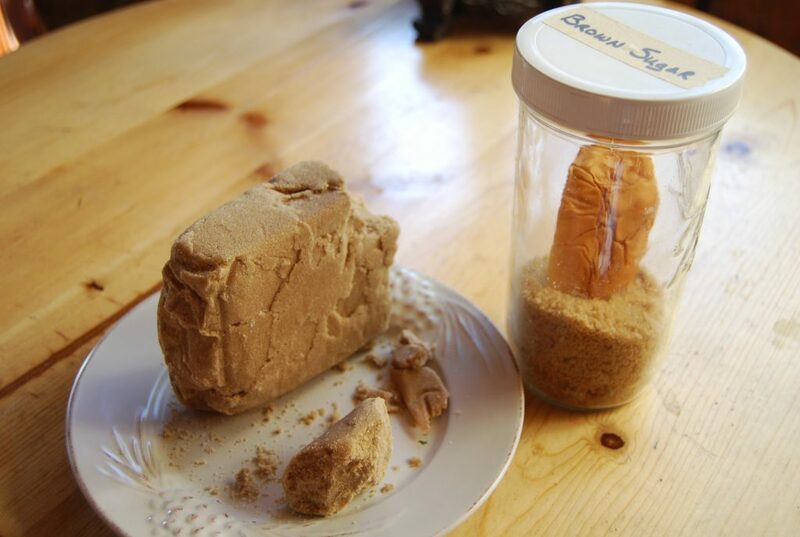 If you’ve got a box of brown sugar that has suddenly taken on the identity of a brick, put it in a jar (or Ziploc bag if it won’t fit) and toss in a heel from a loaf of bread. Close it up and in a matter of days the bread will have your brown sugar nice and fluffy. 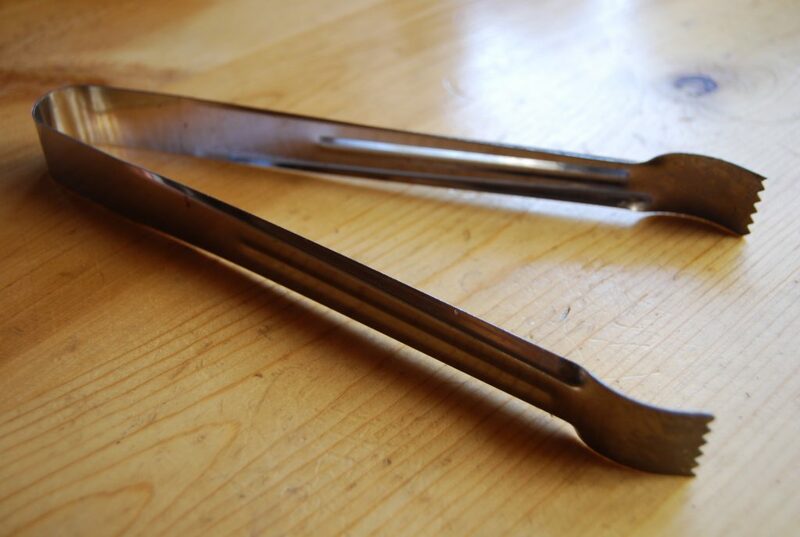 Whether you’re vertically challenged or just have high cabinets, kitchen tongs are like adding an extra length to your arm. Boy, if I had a nickel for every time I saw my Mother do this. 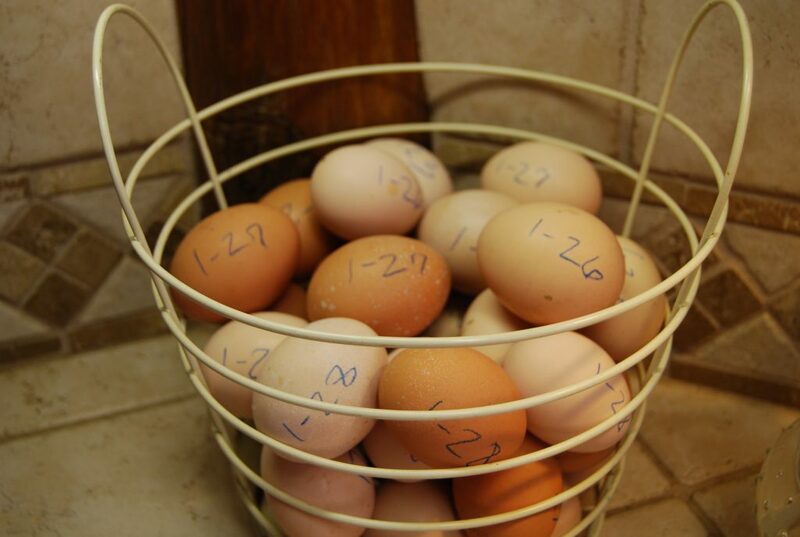 We don’t always use our eggs up quickly so if they’re marked with the date they were gathered from the coop, we don’t have to wonder if they’re still good or not. Any type of non-toxic marking tool will do, we upcycled a broken crayon that was headed to the trash bin. This is especially important if you’re using an old family recipe. Above is 6 cups of flour for a bread recipe of my Great-Grandmother’s. Back when she likely inherited this recipe from her mother, flour wasn’t pre-sifted but was instead sifted directly from the bin in the Hoosier or cupboard. 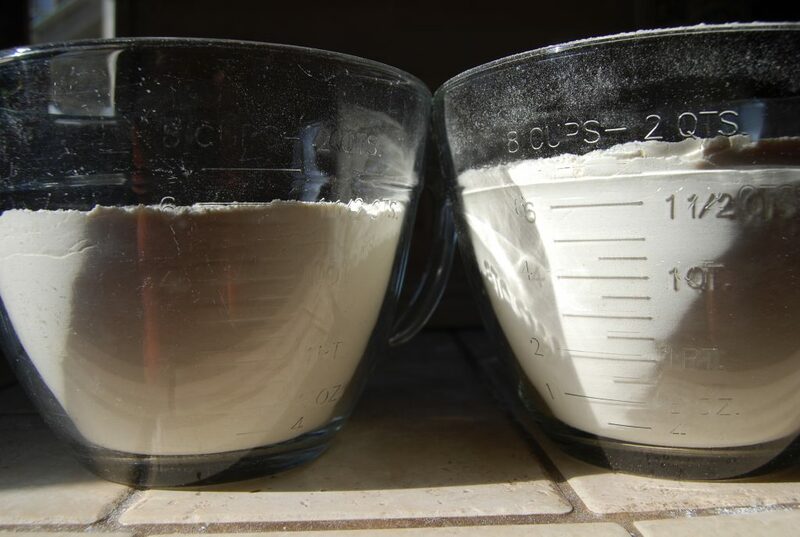 Take a look at what a difference that makes; on the left is straight from a bag of “pre-sifted” flour. On the right is 6 cups of “pre-sifted” flour measured out then sifted like it used to be done. Ooops, my bread would have a full cup of extra flour if I didn’t adjust my method based on the time period the recipe came from. Sifting “pre-sifted” flour and even store bought cake mixes also makes for noticeably fluffier cakes. I should’ve wiped my counter before I snapped this photo… ha! Bone broth is all the rage these days. I admit that I got a chuckle the first few times I heard or read someone raving about this “latest, greatest new trend.” *eye-roll* Growing up, we made bone broth all the time and one of my Mother’s tricks was to put a tiny bit of vinegar in the water while boiling the bones. It doesn’t take much, like a teaspoon for a large stockpot, but the vinegar helps break down the bones so that you get all the marrow out also. Strain it when it’s finished and you’ll notice a difference in the taste versus just boiling it. Less is more though, add only a little because you don’t want to be able to taste it in the broth, just enough to get the job done. 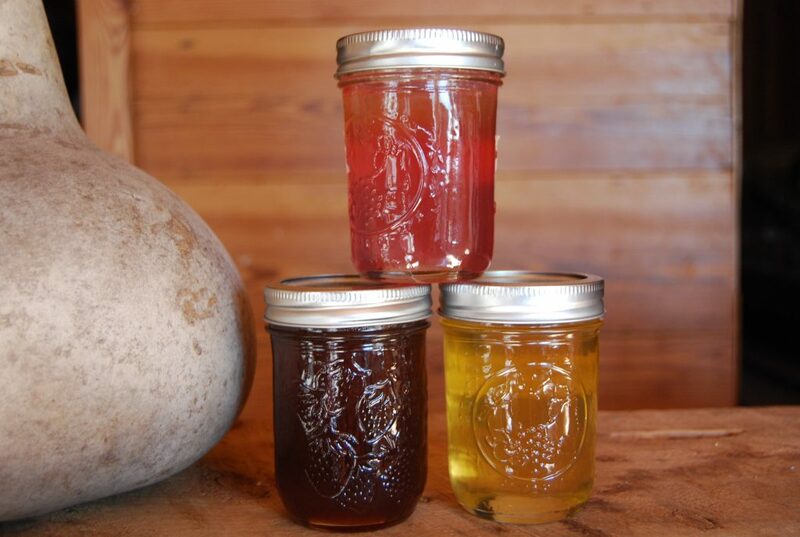 Just a sliver of butter will keep a batch of jelly from foaming when you cook it. Add it before it gets to a rolling boil. 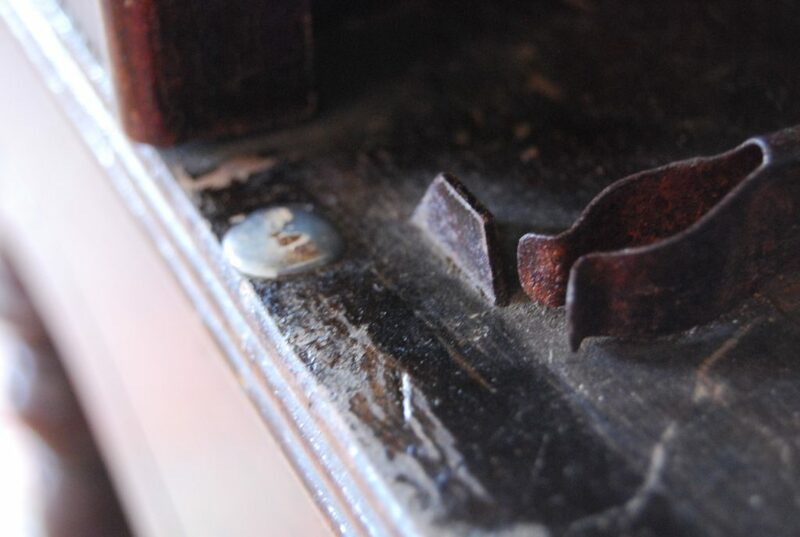 Got a nail hole that’s been wallowed out over time? Tap a toothpick or two into the hole beside the nail to snug it back up. It works with screw holes too if you don’t have a molly. Remove the screw, put the toothpicks in then drive the screw back in. Just FYI, I wasn’t sure if I was remembering correctly that they were called mollies so I googled “screw molly”. I can definitely recommend that you DON’T do that. I’ll also be giving more thought to my search words from now on. I’m terrible to clump up onion and garlic powder by sprinkling it in while something is cooking so we use rice in those much more than for salt anymore. The only catch is finding a shaker lid with smaller holes so the rice doesn’t get through. McCormick’s onion and garlic powder shaker lids have very large holes, but they are interchangeable with other McCormick lids that come with small holes. I just keep the old lid when I buy new powder. I’ve used rice salt shaker forever, but never thought shout putting it in my garlic and onion powder. Nice! Oooh, that’s a good tip, I’ve never used an apple slice. It’s always good to have options! Love these tips. Some were new to me. Coming over from Melissa K. Norris. I have used an apple slice for #2 but not a slice of bread. I will have to try this one.